The Bay Area Science Festival, a two-week celebration of Northern California's science institutions, kicks off today through November 7th. With 50 events scattered among the California Academy of Sciences, The Exploratorium, the Oakland Zoo and others, the activities are designed for both kids and adults. Check out slimy, scaly, and hairy creatures at the Lawrence Hall of Science's Animal Discovery Room, or learn about the science of beer at a fermentation microscopy demonstration. The festival is in its fifth year and encourages Bay Area residents to "unleash your inner scientist." With so many events to choose from, we've selected five that are great for all ages. Join U.S.Fish and Wildlife ranger Joseph Garcia on a bicycle tour of more than 15,000 acres of former salt ponds that are being transformed back into salt marsh. It's one of the nation’s largest restoration projects and bird sightings are likely. Swissnex San Francisco will teach you the science and technology behind some of the world’s most advanced bio-inspired robots, with special guests from Stanford University, NASA, and UC Berkeley. You'll learn the secrets of the lab’s fast-running Cheetah-cub robot, a salamander bot that navigates both land and water, and modular machines designed to be the building blocks for furniture that moves and evolves. Have you ever wondered what happens to the dirty water from your shower, laundry and toilet after it goes down the drain? What about the runoff from lawns and gardens, rainwater and car washing? You’ll see first-hand what happens after you flush, learn about the wastewater treatment process, and what's being done to protect public health and the environment. Learn more about the science of fermentation and the natural history of organisms that carry them out. What odd life forms make your bread and cheese, and beer and wine? Join Counter Culture Labs, where the San Francisco Microscopical Society will have a microscopic menagerie set up to show first-hand the invisible world and hidden beauty behind fermented foods. Join KQED at the festival’s finale event. 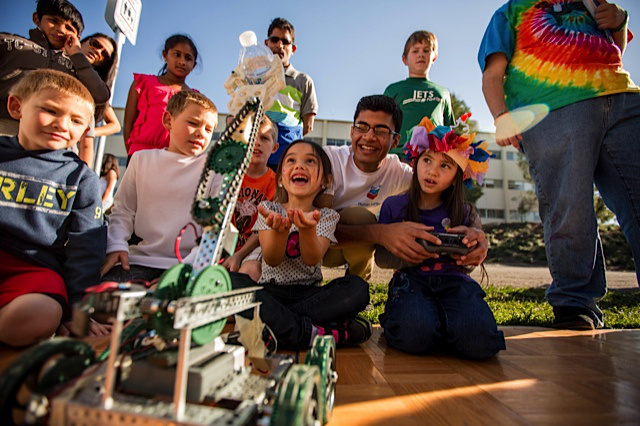 This free event features hundreds of hands-on science activities, opportunities to meet local scientists and engineers, plus endless educational entertainment, including a Robot Zoo and the debut of the STEAM Carnival. KQED Members can access the event early by showing their member ID at Portwalk Gate starting at 9:30AM. KQED will also be participating in various events throughout the festival including NOVA’s Making North America screening on Oct. 23 at 6pm; Deep Look’s screening with UC Berkeley on Nov. 2 at 5pm; San Francisco Green Film Festival’s screening of Monsoon on Nov. 3 at 6pm and Discovery Days at AT&T Park on Nov. 7 at 10am.